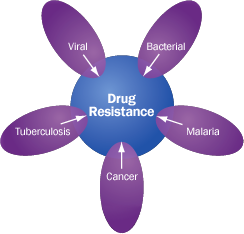 The Institute for Drug Resistance (IDR) was created to serve the drug resistance research and clinical communities. Founded upon the observation that close parallels can be drawn between resistance seen in one disease state and resistance seen within another, the IDR believes that cross-disciplinary collaboration and discussion could allow for a better understanding of resistance and result in real clinical benefits. Enable collaborations between research and industrial scientists and clinicians.